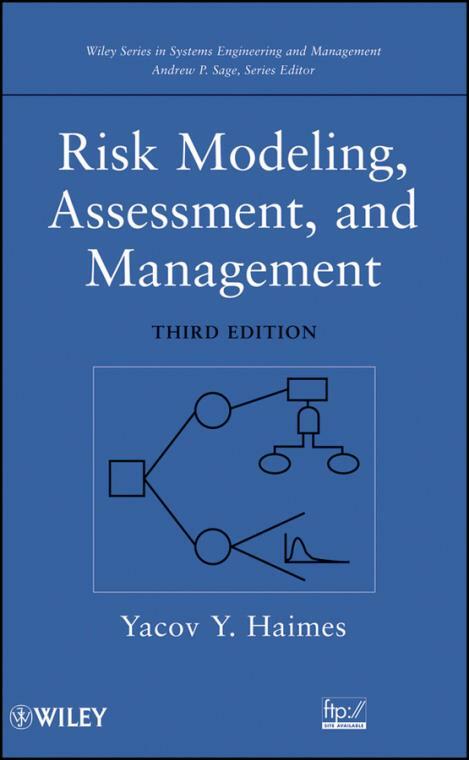 Risk Modeling, Assessment, and Management, Third Edition describes the state of the art of risk analysis, a rapidly growing field with important applications in engineering, science, manufacturing, business, homeland security, management, and public policy. Unlike any other text on the subject, this definitive work applies the art and science of risk analysis to current and emergent engineering and socioeconomic problems. It clearly demonstrates how to quantify risk and construct probabilities for real-world decision-making problems, including a host of institutional, organizational, and political issues. This is an indispensable resource for academic, industry, and government professionals in such diverse areas as homeland and cyber security, healthcare, the environment, physical infrastructure systems, engineering, business, and more. It is also a valuable textbook for both undergraduate and graduate students in systems engineering and systems management courses with a focus on our uncertain world. PART I: FUNDAMENTALS OF RISK MODELING, ASSESSMENT, AND MANAGEMENT. 1. The Art and Science of Systems and Risk Analysis. 1.3 Risk Assessment and Management. 1.4 Concept Road Map: The Farmer's Dilemma. 2. The Role of Modeling in the Risk Analysis Process. 2.2 The Risk Assessment and Management Process. 2.3 Information, Intelligence, and Models. 2.4 The Building Blocks of Mathematical Models. 2.5 The Farmer's Dilemma Revisited. 3. Identifying Risk Through Hierarchical Holographic Modeling. 3.3 Hierarchical Holographic Modeling (HHM). 3.4 Hierarchical Holographic Modeling and the Theory of Scenario Structuring. 3.5 Adaptive Multiplayer HHM (AMP-HHM) Game. 3.8 HHM in a System Acquisition Project. 3.10 Hardening the Water Supply Infrastructure. 3.11 Risk Assessment and Management for Support of Operations Other Than War. 4.2 Decision Rules Under Uncertainty. 5.2 Examples of Multiple Environmental Objectives. 5.3 The Surrogate Worth Trade-off (SWT) Method. 5.4 Characterizing a Proper Noninferior Solution. 5.5 The Surrogate Worth Trade-off Method and the Utility. 6. Defining Uncertainty and Sensitivity Analysis. 6.2 Sensitivity, Responsivity, Stability, and Irreversibility. 6.3 Uncertainties Due to Errors in Modeling. 6.4 Characterization of Modeling Errors. 6.6 The Uncertainty Sensitivity Index Method. 6.7 Formulation of the Multiobjective Optimization Problem. 6.8 A Robust Algorithm of the USIM. 6.9 Integration of the USIM with Parameter Optimization at the Design Stage. 7. Risk Filtering, Ranking, and Management. 7.2 Past Efforts in Risk Filtering and Ranking. 7.3 Risk Filtering, Ranking, and Management A Methodological Framework. 7.4 Case Study: An Operation Other Than War. PART II: ADVANCES IN RISK MODELING, ASSESSMENT, AND MANAGEMENT. 8. Risk of Extreme Events and the Fallacy of Expected Value. 8.2 Risk of Extreme Events. 8.3 The Fallacy of the Expected Value. 8.4 The Partitioned Multiobjective Risk Method. 8.5 General Formulation of the PMRM. 8.6 Summary of the PMRM. 8.8 Analysis of Dam Failure and Extreme Floods Through the PMRM. 9.3 Differences Between Single- and Multiple-Objective Decision Trees. 10. Multiobjective Risk Impact Analysis Method. 10.3 The Multiobjective, Multistage Impact Analysis Method: An Overview. 10.4 Combining the PMRM and the MMIAM. 10.5 Relating Multiobjective Decision Trees to the Multiobjective Risk Impact Analysis Method. 11. Statistics of Extremes: Extension of the PMRM. 11.1 A Review of the Partitioned Multiobjective Risk Method. 11.3 Incorporating the Statistics of Extremes into the PMRM. 11.4 Sensitivity Analysis of the Approximation of f4 (- ). 11.5 Generalized Quantification of Risk of Extreme Events. 12. Bayesian Analysis and the Prediction of Chemical Carcinogenicity. 12.2 Calculating Sensitivity and Specificity. 12.4 Determining the Performance (Predictivity and Selectivity) of the Test Battery. 12.5 Trade-offs and Policy Analysis. 13.3 Reliability and Fault-Tree Analysis. 13.5 The Distribution Analyzer and Risk Evaluator Using Fault Trees. 13.6 Extreme Events in Fault-Tree Analysis. 13.7 An Example Problem Based on a Case Study. 13.8 Failure Mode and Effects Analysis (FMEA); Failure Mode, Effects, and Criticality Analysis (FMECA). 14.2 Mathematical Formulation of the Interior Drainage Problem. 14.3 Formulation of the Optimization Problem. 14.4 The Multiobjective Statistical Method (MSM): Step-by-Step. 14.5 The Surrogate Worth Trade-off (SWT) Method. 15. Principles and Guidelines for Project Risk Management. 15.2 Definitions and Principles of Project Risk Management. 15.3 Project Risk Management Methods. 15.5 Quantitative Risk Assessment and Management of Software Acquisition. 15.6 Critical Factors That Affect Software Nontechnical Risk. 15.7 Basis for Variances in Cost Estimation. 16. Applying Risk Analysis to Space Missions. 16.2 Overview of Selected Space Missions. 16.3 Risk Analysis Examples for Selected Space Missions. 16.5 Risk Filtering, Ranking, and Management. 17. Risk Modeling, Assessment, and Management of Terrorism. 17.2 On the Definition of Vulnerabilities in Measuring Risks to Infrastructures. 17.3 Risk-Based Methodology for Scenario Tracking, Intelligence Gathering, and Analysis for Countering Terrorism. 17.4 Homeland Security Preparedness: Balancing Protection with Resilience in Emergent Systems. 17.5 Risk of Terrorism to Information Technology and to Critical Interdependent Infrastructures. 18. Inoperability Input-Output Model and Its Derivatives for Interdependent Infrastructure Sectors. 18.2 Background: The Original Leontief I/O Model. 18.3 Inoperability Input-Output Model (IIM). 18.5 Supporting Databases for IIM Analysis. 18.6 National and Regional Databases for IIM Analysis. 18.7 Regional Input-Output Multiplier System (RIMS II). 18.8 Development of IIM and Its Derivatives. 18.10 Practical Uses of IIM. 19.1 A Risk-Based Input-Output Methodology for Measuring the Effects of the August 2003 Northeast Blackout. 19.2 Systemic Valuation of Strategic Preparedness Through Applying the Inoperability Input-Output Model with Lessons Learned from Hurricane Katrina. 19.3 Ex Post Analysis Using the IIM of the September 11, 2001 Attack on the US. 19.4 Risk Modeling, Assessment, and Management of Lahar Flow Threat. 19.5 The Statistics of Extreme Events and 6-Sigma Capability. A.1 Introduction to Modeling and Optimization. A.2 Classical Unconstrained Optimization Problems. A.3 Classical Equality Constraint Problem. A.9 Derivation of the Expected Value of a Log-normal Distribution. A.10 Derivation of the Conditional Expected Value of a Log-normal Distribution. A.11 Triangular Distribution: Unconditional and Conditional Expected Values. A.12 Standard Normal Distribution Probability Table.